Perhaps Max Estrada’s death saved two other lives The 20-year-old Chico man was leading a team of Marines to a night ambush site in Quang Nam Province outside Danang when they encountered a large enemy force. Estrada was killed in the first burst of fire. His two cousins, who still live in Butte County, were also serving with the Marines within several miles of Estrada. The cousins accompanied his body home and were told by officials after they arrived back in the States that they did not have to return to Vietnam. Estrada was born in Bakersfield in 1950, where he went to elementary school. A Chico High School dropout, he joined the Job Core and received training as a draftsman in Pleasanton. He was working at Lawrence Livermore National Laboratory when he joined the Marines in February 1970. “He won the respect of his men and fought hard,” wrote his commanding officer. “He had a good future,” said his mother. Max was born in Bakersfield, Kern Co, CA, where he went to elementary school. A Chico High School drop-out, he enrolled at the Job Corps in Pleasanton and received training as a draftsman. Max was working for Lawrence Livermore Laboratory when he decided to enlist on 13 February 1970 in Oakland, CA. Max arrived in Vietnam 25 August 1970, and was assigned to CAP2-2-4, CACO2-2, 2nd CAG Combined Action. He was leading a squad team of Marines to a night ambush site, outside of Da Nang when the Marines encountered a large enemy force, about 3 kilometers southwest of Dai Loc District. 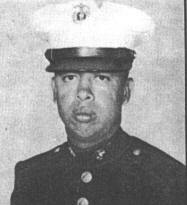 LCPL Estrada was killed in the first burst of fire. Two cousins that were serving in Vietnam with the Marines accompanied the body home. They were told that they didn't have to return to Vietnam. Max was single and served his country for one year.